My name is Al Miller, and I am currently a County Council Member in Cecil County. I am a lifetime resident of Cecil County and I am very passionate about our county! I ran for Cecil County Council for the third district seat so I can serve the people of Cecil County. I have been a resident of Cecil County for 63 years and I have spent my lifetime committed to the community of Cecil County. I have volunteered with many local organizations including the Cecil County Fair Board, Cecil County Chamber of Commerce, Cecil County Election Board, Cecil County Farm Bureau, Rising Sun Booster Club, and Janes United Methodist Church. I strongly believe that when you are able to get people to work together you can accomplish anything. 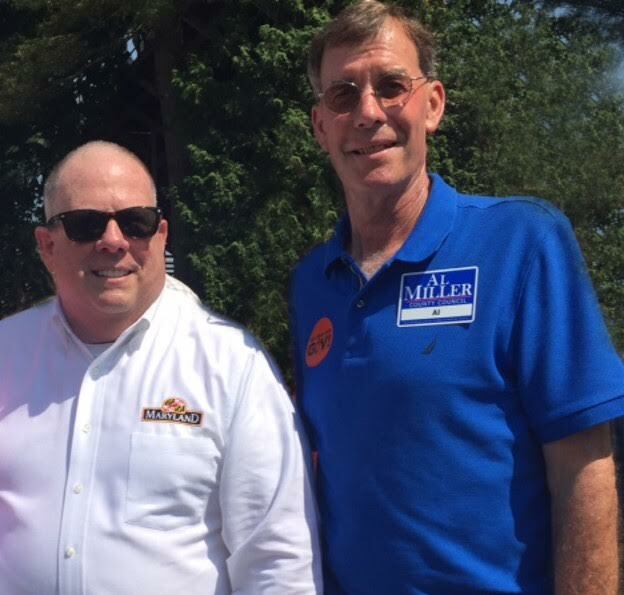 Al Miller with Governor Hogan. Our local economy is positioned to take advantage of both commercial and agricultural economic development. A vibrant community relies on services like public safety and public works as well as amenities like parks and recreation programs. Al Miller is a lifelong resident of Cecil County and holds the chair in the Cecil County Council representing District 3 (Rising Sun, Cherry Hill, Calvert and Fair Hill).